I had a phenomenal start to my journey. Target Field was cozy and inviting. There are very few, if any, bad seats in the whole stadium. We were treated to a great pitching performance by Kyle Gibson and got to see two of the highest paid players in the game: Joe Mauer ($23 million a year) and Robinson Cano ($24 million a year). Final score: Twins 5, Mariners 4. I had a great time meeting fans and hearing their stories. Below are some pictures from my visit. Hope you enjoy them! Bill Greenzweight has attended Twins games since 1986 and holds season tickets this year. 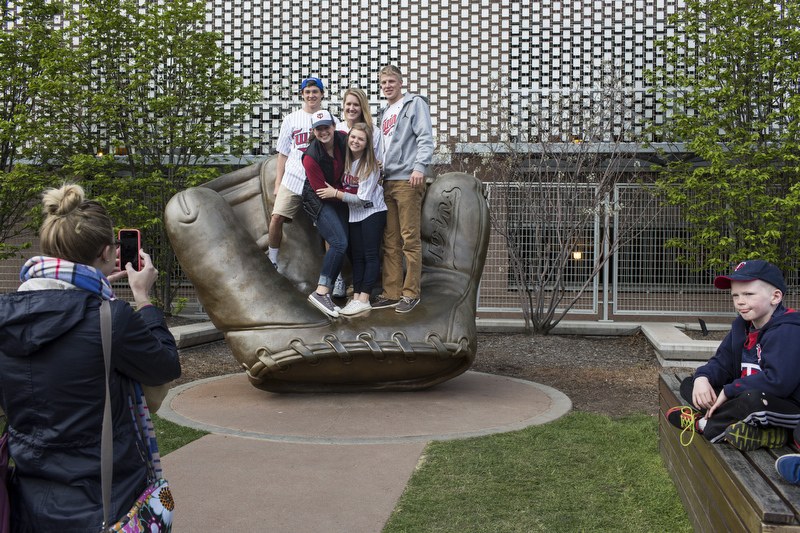 Sam, Kelsey, Bree, Kelsey and Chad take a photo outside of Target Field. Former Twins Manager Tom Kelly watches the flag during the singing of God Bless America. Sue Nelson plays organ at Target Field. She plays in a box where fans are able to visit with her during the game. Relief pitcher Tom Wilhelmsen warms up. Usher Tom Rooney is in his fourth year with the Twins. "You can either have 400 hours of fun or you can have 400 hours of work. I choose fun." Kamiel Bhola eats cotton candy at her first ever baseball game.